Russian opposition leader Alexei Navalny was detained outside his home in Moscow on Saturday for reasons that were not immediately clear, injuring a finger in the process, his spokeswoman said on Twitter. "Navalny was detained two hours ago outside his home. He is now in the Danilovsky police station. They did not say why he is being detained. They took his phone away," Kira Yarmysh tweeted. In an interview to radio station Ekho Moskvy, Yarmysh said it was "probably linked" to Navalny's plans to hold protests against the Russian government's unpopular pension reform on September 9. In a blog post published on Saturday, Navalny said the protests would take place in Moscow and "in almost a hundred other cities." The opposition politician has criticised the planned pension age hike -- a first in nearly 90 years -- that has led to a rare outburst of public anger. Following his detention, Navalny was briefly treated in hospital, with an apparent broken finger, Yarmysh added. More than 2.8 million Russians have signed a petition against the pension reform which is backed by President Vladimir Putin's ruling party. 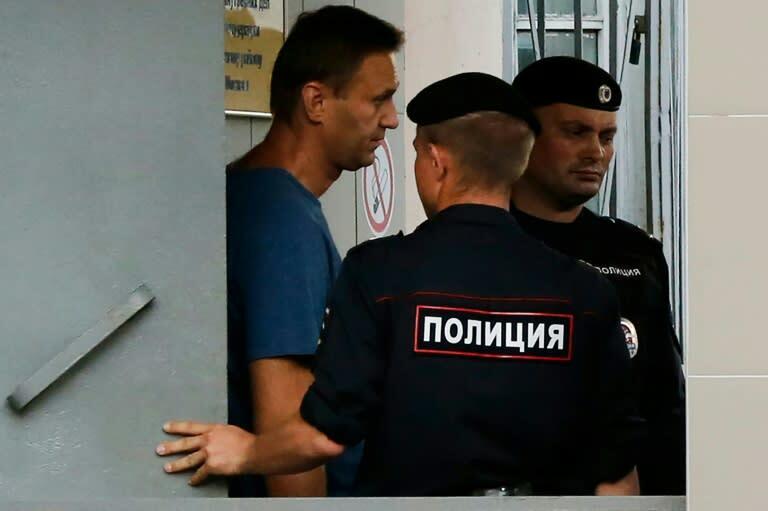 Navalny, who was barred from taking part in Russia's March presidential election, served a month in prison in June after organising demonstrations ahead of Putin's fourth inauguration in May. He was freed from prison the same day the World Cup started in Russia. The 42 year-old anti-corruption activist has faced a string of charges since he became the leading opposition figure campaigning against Putin's rule at mass demonstrations in 2011 and 2012.